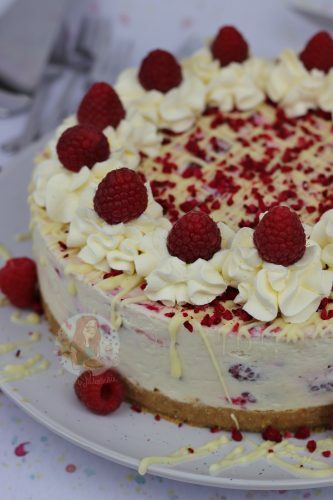 A No-Bake White Chocolate and Fresh Raspberry Cheesecake with a Buttery Biscuit Base, White Chocolate & Raspberry Cheesecake Filling, with Fresh Cream, White Chocolate Drizzle and even more Raspberry! 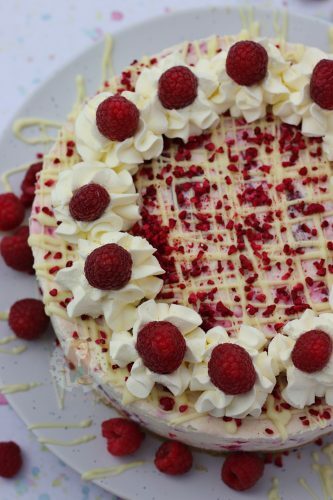 So I adore the combination of White Chocolate and Raspberry together… because its an absolute dream. 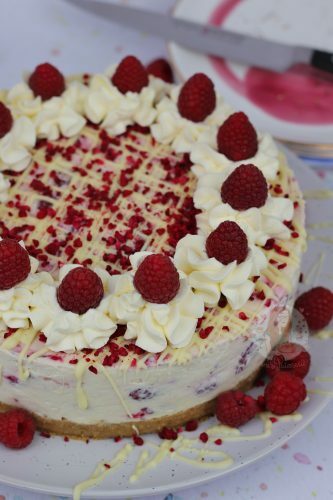 My White Chocolate & Raspberry Blondies recipe, and my Raspberry & White Chocolate Mousse are some of my absolute favourites, and this cheesecake tops them. I posted my No-Bake White Chocolate & Strawberry Cheesecake recipe years ago as one of the first recipes on my blog, and its always been a hit. To me, I love the combination of White Chocolate and Strawberries together, but I do admit that Raspberries are a better combination. Like honestly, its just DELICIOUS. I obviously can’t resist doing a No-Bake style cheesecake, as I just find them the best thing ever. 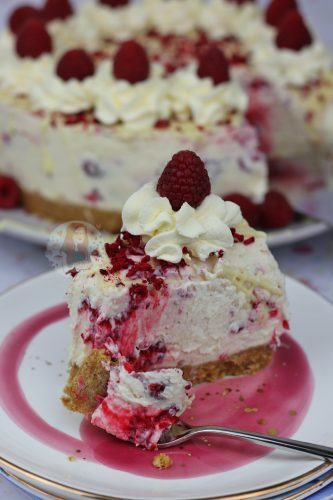 But its something that you can also look into a baked cheesecake style if you prefer.. but to get the true taste of the White Chocolate and Raspberry together I think No-Bake is best. I think it stays lighter, creamier, and tastier. You can use either Philadelphia for example, or you can use Mascarpone.. but either way it just has to be full fat. Philadelphia (or other similar ones) give a bit more of a Tart taste to it (sharp taste) whereas Mascarpone is naturally sweeter. Both set well, but I generally do find that Mascarpone sets slightly better as it has less ‘water’ in it for me. This might not be true, but I have always found it to be that way. I tend to prefer using Philadelphia for cheesecakes that use Milk Chocolate or Dark Chocolate, but Mascarpone for White Chocolate ones. This is purely through making oodles of cheesecakes over the years now. The addition of Icing Sugar is optional, but I do prefer it. It works better then any other sugar because its so fine it dissolves. This recipe is obviously very similar to my No-Bake White Chocolate & Strawberry Cheesecake, but I don’t mind that. I’ve mentioned before how some of my recipes will be similar to others because its what people search for and the specifics that help them find my recipes. But honestly, I’m glad I am posting this one because its SO VERY YUMMY. As you can see in the pictures of the slices, you can see the fresh raspberries throughout. They create a wonderful pocket of flavour, amongst the sweet creamy cheesecake. I obviously go a little all-out for the decoration, but its all optional. The drizzle of the chocolate, the sweetened whipped cream, and the extra raspberry decorations. All of my no-bake cheesecakes can be frozen, or made into mini ones! I realise my recipes are quite ‘large’ so if you’re only a small family, or theres only a couple of you, then you can easily make these into jars, or even small sized ones. The mixture splits evenly and easily. You can also just make a large one and freeze it. Luckily with it being no bake, all you have to do is let it set fully in the fridge overnight, and then freeze after setting. 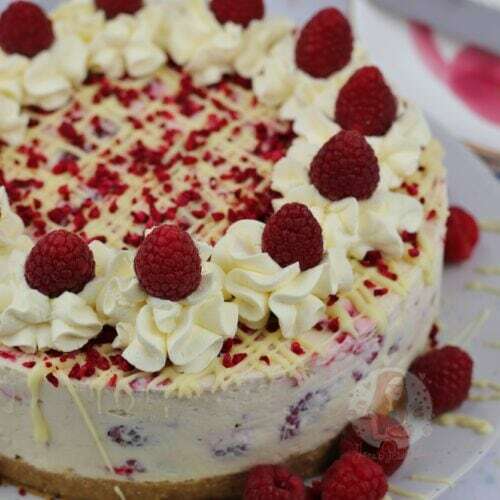 White Chocolate & Raspberry Cheesecake! Blitz the biscuits in a food processor to a small crumb, and add the melted butter – either pulse in the food processor a few times till the mixture is combined, or mix it in a bowl. Tip the biscuits into a 8″/20cm Deep Springform Tin and press down firmly. Melt the chocolate in a bowl over a pan of simmering water, or in the microwave on short bursts until full melted – leave to cool whilst doing the rest. In your stand mixer with the whisk attachment, whisk together the cream cheese, icing sugar and vanilla together till smooth. Pour in the double cream and whisk till thick! Once completed, pour in the cooled white chocolate, and whisk briefly to combine, and then fold through the fresh raspberries. Spread the mix over the biscuit base, smooth over and chill in the fridge for at least 5-6 hours, or preferably overnight so it will definitely be set. Once set, decorate. Drizzle over the melted white chocolate, and whip together the double cream and icing sugar and then pipe on in swirls! I use a 2D Closed Star Piping. I then add some fresh Raspberries for each swirl, and then I sprinkle on some Freeze Dried Raspberries! I recommend using a 8″/20cm Deep Springform Tin in this recipe! And I use a 2D Closed Star Piping Tip to decorate! I buy my freeze dried raspberries in Waitrose, but they can also be found sometimes in Sainsbury’s… or Lakeland! This recipe will last in a fridge for three days! Older Next post: S’mores Dip! Newer Previous post: Billionaires Tart! Can you use half Philadelphia and half mascarpone? I have tried but once I add the cooled chocolate it seems to soften and not set well? Hi! Can you tell me how long it will last in the freezer? And would it still be ok to eat after 4 days once thawed? Hi, would it be okay to use single cream and whip it first? Any time I use mascapone and add the cream in as a liquid, it doesn’t set properly, how long would you whip it for and on what speed? Thank yo! You can whip the cream separately, but you would still need to use double cream – single cream is too thin. You need to whip the cream up to just before stiff peaks, and then fold into the mixture. It tasted delish and was a massive hit however wasn’t as firm as I would have liked. Do you have any suggestions pls? You didn’t whip it enough, you just need to whip it up a bit more! Thank you so much! I shall try that. I am planning to make it again this weekend as my friend is coming!!! Jane.. 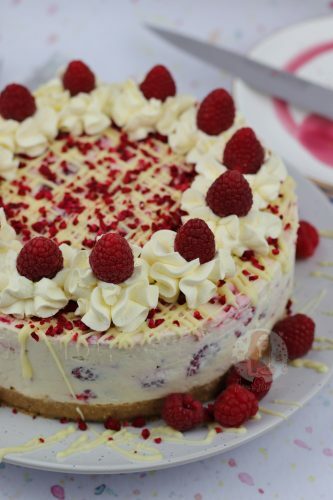 I love you so much… I’ve made your white chocolate and raspberry cheese cake 4 times. Comes out right everytime… It’s amazing… I’m no good at baking, everytime I’ve made your cheesecake people ask for the recipe they love it so much.. I tell them its my friend Jane’s recipe. Thank you so much. Would it be ok use the same quantity of gluten free biscuits? Love your recipes but now gluten free so trying to adapt! Yes! I’m not sure whereabouts you’re based, but I liked Tescos own gluten free digestives for my cheesecake bases! You could certainly give it a go, but because its not baked, they might ooze some liquid through thawing! 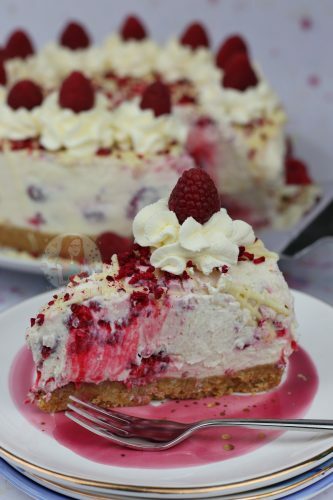 I want to make a similar cheesecake but use crush milkshake which is a liquid have you got any advice as to how I could alter this recipe to achieve that. Hiya – You can use milkshake powders in cheesecakes to flavour but if you want to use actual liquid you’d have to use gelatine to set it like I do in my Gin and Tonic Cheesecake. Just tried this. It has been 12 hours and still hasn’t set 🙁 Maybe I should’ve whipped the double cream before adding it to the cheesecake mixture. I’m going to leave it another 20 hours (its for Mothers day) and see if it sets.. but I doubt it. Ice cream cheesecake should be nice. How did it turn out? It probably was that it wasn’t thick enough but I hope it tasted okay! I live in the UK so its in grams.